A leaking toilet from a second-floor bathroom provided the perfect opportunity for a master bath redesign led by Alspaugh Kitchen and Bath. The dramatic Calacatta Michelangelo marble became the star of the show. 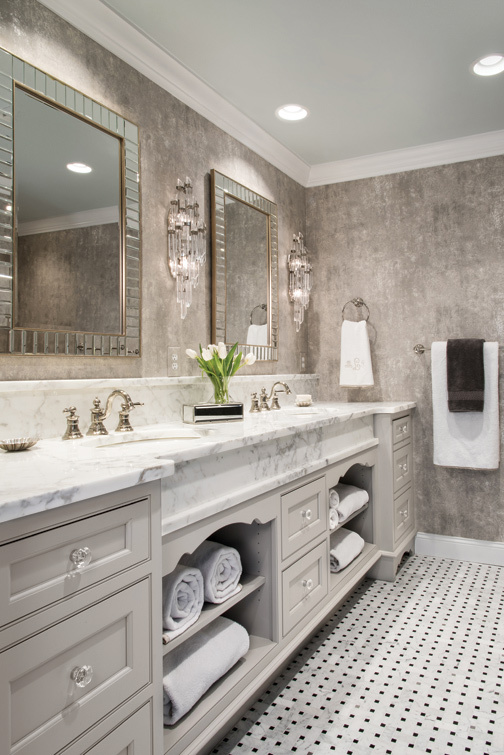 The marble lines the shower walls and entry and tops the vanity cabinets setting the soft-gray color palette. A marble apron extends in front of both Kohler sinks and mirrors the profile of the backsplash shelf. The shower features two sets of Grohe showerheads and hand-held showers making it a luxurious space for two. Open shelving under the sinks provide a space to store and display towels. The custom valance cutout adds a touch of elegance and matches the toe cutouts beneath the drawer base. Custom cabinetry conceals a pullout wastebasket disguised as a drawer base. For a bit of sparkle in the space, stainless-steel tiles are interspersed among the black tile inserts in the basket-weave-patterned marble mosaic floor. A textured cork wallpaper with a metallic sheen, polished nickel faucets, decorative mirrors and crystal sconces and knobs provide additional elegance to the space. We are drawn to the vibrancy of the floor pattern. The material choices make for a cohesive design. We can’t get enough of the marble drop-face vanity top. The metallic wallpaper is an added touch of elegance.